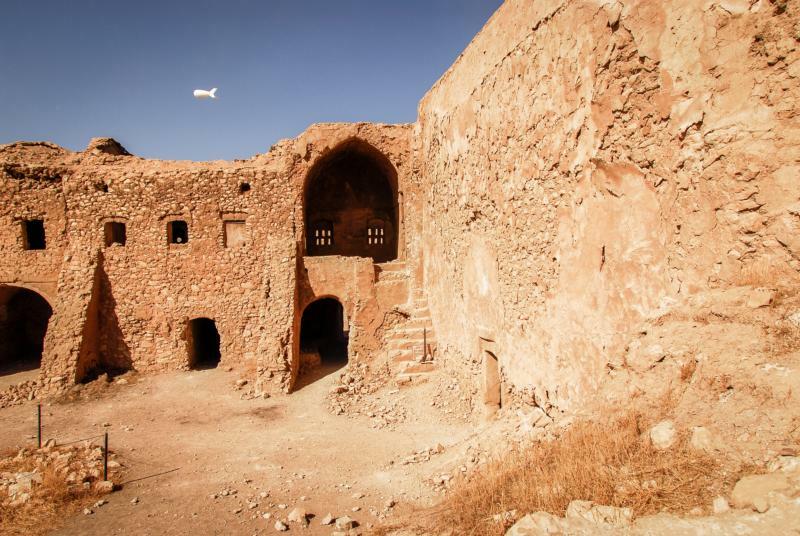 AMMAN, Jordan (CNS) — Catholic clergy lamented the destruction of Iraq’s oldest Christian monastery, St. Elijah, and urged the international community to do more to stop such assaults. “I had the same emotional and perhaps spiritual experience as I did when I was standing over the bodies of fallen soldiers,” Father Jeffrey Whorton told Catholic News Service after seeing pictures of the monastery’s destruction. The last recorded church service in recent years to take place inside the monastery’s walls was the Easter Vigil in 2010, but that was held in the courtyard rather than the altar area. “I was able to offer Mass there three or four times on that altar. I was made very aware of the great cloud of witnesses,” said Father Whorton, explaining his sense of those ancient Christians who had worshipped over the centuries at St. Elijah. People were forced to bend down physically to enter the monastery. It was a “humble acquiescence of bending low for this great space that you are entering,” the priest said. Father Whorton said another unusual feature was a piece of wood shaped like a yoke that stood above the entrance to the nave. “For me, there was a kind of putting on the yoke of Christ and to bend low into that space where my fallen brothers and sisters had died (centuries ago). It was extremely emotional and a spiritually palpable event for me,” he said of his experience ministering in the ancient monastery. “God became present once again on that ancient altar as he has done thousands and thousands of time throughout the 1,400 years of its existence. That’s the weight of glory,” Father Whorton said. Father Whorton said the finality of ancient monastery’s fate has weighed heavy on him. “I did not realize until I saw the pictures of the destruction that I would be one of the ones to literally close the door on this ancient church,” he said. “I hope that I closed it with all the necessary decorum that is due to such a venerable place,” he added. Assyrian Father Emanuel Youkhana, who heads the Christian Aid Program Northern Iraq, CAPNI, denounced the attack as yet another assault once again on Christians and their heritage in their ancient homeland. “Dozens and dozens of scientific, philosophic, historical and other books were written or translated in such monasteries. This is a memory of Iraq which has been cut off,” he told CNS. “When they damage my 2,000 years of Christianity and 5,000 years of Assyrian heritage as the indigenous people of this country, my question is this: If my history is being damaged, my present is being threatened, is there any future?” the cleric asked. He cited examples of the Islamic State’s bulldozing the Assyrian city of Nimrod, where the Tower of Babel is believed to have existed. The United Nations called its destruction cultural cleansing and a war crime. Father Youkhana also drew attention to the destruction of archaeological sites in Ninevah along with the forced displacement of Christians and other religious minorities long present in Iraq from their historic area.